Strophurus taenicauda is an arboreal species of gecko. They can be distinguished from other Strophurus by its lack of tubercles on the body and tail. Strophurus taenicauda has a brightly colored tail (golden) stripe versus the (common) white, black, or gray found in other species. They species can have red or white eyes. There are three described subspecies of Strophurus taenicauda; S.t.taenicauda, S.t.albiocularis and S.t.triaureus. Typical food includes insects. In addition to the usual crickets are smaller cockroaches species or wax worms, as well as (from time to time for adult Strophurus taenicauda) skinned black beetle larvae (Zophobas). It should, of course, also be ensured that there is a variety of nutritious food available, because wax worms or darkling beetle larvae alone can lead to unwanted fatty degeneration of the animals, which of course in turn brings diseases of the liver or other organs with it. The healthy mix of various food options is important. There should be great value placed on feeding animals with good food; keep all foods in a large container and provide fresh forage or high-quality dry food. 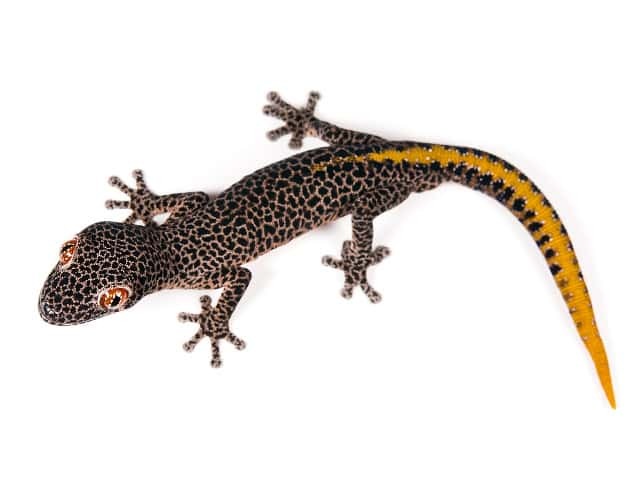 I prefer not to handle them like some people do it with leopard geckos, for example. Observing them is better. Strophurus taenicauda is a relaxed Strophurus species, so handling will not be a problem, but sometimes more nervous animals, can squirt some bad liquids out of there tails. Those smell bad and can hurt getting them into the eyes or so.